Not happening today. Can’t say I’m surprised. I kinda had a feeling that it wouldn’t. They aren’t ruling out the possibility of tomorrow though. I’m really hoping… would be SO nice to have her home for Father’s Day! She continued to have bloody poop throughout the night and this morning. We are going to try and change her formula again to see if that helps. I’m not sure that is THE reason… but it will be easier to digest so hopefully will help. Her sodium was low today, as was her chloride. 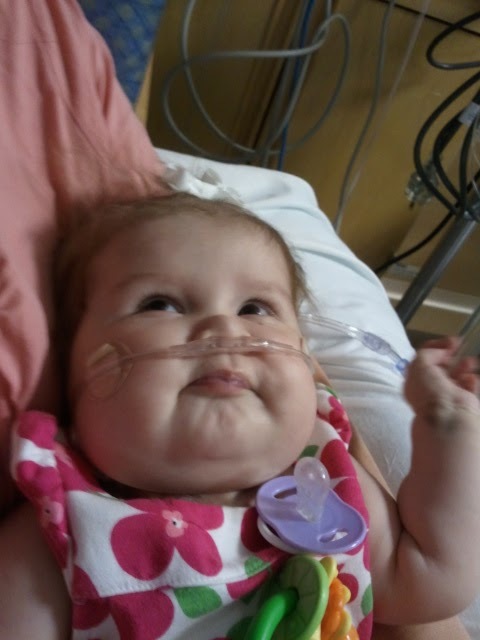 They started her on Potassium-Chloride yesterday… starting Sodium-Chloride today. Blah. She didn’t pee as much as we would have liked yesterday. So we are increasing Lasix again. Her pacing study went better this morning. They will still able to induce her tachy episodes (fast, irregular heart rate), but it took a lot longer so the medicine helped some. She did have 2 incidents of fast heart rate that resolved themselves quickly overnight, which worries me a little. We are going up on her new medicine, and they aren’t going to redo the pacing study at this time, since it was clear that it was helping. So… if her electrolytes are better tomorrow… and she doesn’t have any issues today or overnight… we’ll go home sometime tomorrow. Car is still acting funny this morning. Scott was debating to take it in to get checked… or drive it to the hospital anyway. He was debating when I last spoke with him this morning. Guess I’ll find out soon enough! Funny: Night-shift nurse said this morning. “I’ll be honest with you. She had a few episodes of high heart rate, three hem-positive stools, and we had to go up on her oxygen because she kept desatting.” I just gulped. “But the good news is….” I perked up… “She’s cute and adorable!” Yes… Yes that is good news! She has TOTALLY taken my “good thoughts” sign to heart! On a HAPPY note: After a disheartening doctor’s rounds this morning, I came back into Annabelle’s room and looked down at her,a nd she looked pretty content (rare as of late.) I smiled at her and played with her, and tickled her under her armpits. And she LAUGHED!!! She’s done it before… like little laugh, but this time she actually had a little belly laugh in it! Much, much needed today. WOOHOO for Annabelle laughs!!! Romans 15:13 (NLT) – I pray that God, the source of hope, will fill you completely with joy and peace because you trust in Him. Then you will overflow with confident hope through the power of the Holy Spirit. Amen??? AMEN!!!!! I pray that for, yes, for my family, but for ALL my blog readers today too!!! Here we are trying to encourage you and you encourage us with an awesome scripture! Thanks for the reminder. I continue to pray for you all! God is so big and awesome for all he has brought you through. I am glad she laughed today!! I am sorry she didnt get to go home today. I am sorry she is also on so many medications. Thank you for the great verse you posted. I hope that is home soon!! Praying you guys go home today, or at the latest tomorrow, and Annabelle gets to spend Father's Day at home with her daddy. May God continue to bless you guys. It seems like you got some sleep last night or the Oreos did their job. 😉 (I'm not trying to be critical … God alone knows the amount of whining I've done and the chocolate and soda I've consumed to "medicate" myself when having "one of those days".) There is such a change in attitude between your two posts. I think most would I agree with me that we all would probably do some whining if we were in your shoes but for you to turn around today and encourage your blog readers with scripture is truly humbling and inspiring. Thanks, Krista! We will continue to pray for Annabelle. I hoping she gives you a lot more of those belly laughs and that God will continue to bring healing to her body. We will also pray for the car to work and that, Lord willing, she'll be able to come home in time for Father's Day. Home by Sunday would be awesome! We use Pediatric Compleat…its a food based formula…not milk or chemical based. 1 cal/ml. Also, we use Spironalactone (along with 2 other diuretics…you wouldn't believe the lasix dose if I told you!!) as its a potassium sparing diuretic easier on tummy too. That little girl has gone through so much. It's wonderful to hear that she's laughing! I hope and pray that both of you will be going home tomorrow. Trusting in You that you will give this cherub the rest she needs and deserves…we need a calm patch here without episodes, desats, vomiting, fever, irritability…we need calm and peace and we need it now. Clear lungs, wet diapers, sleeping baby, dimples and smiles, a break for sweet momma and daddy. Thank you Dear Jesus and all of the heavenly angels who will gather now at her side. Take a big deep breathe Krista and Scott. Praying for Annabelle, you and your family everyday! Have you tried Farrell valve bags to continuously vent her gtube at night? Call the surgery clinic to try and get one for her to try or see if the nurse can track one down. Hoping and praying you all get to go home and stay home soon!! Just keeping you in my prayers. Thanks for the beautiful scripture, too.